Zhang, X., Zhang, X. and Yin, L. (2015). Measurement of H+ Flux in Rice by Non-invasive Micro-test Technology. Bio-protocol 5(23): e1649. DOI: 10.21769/BioProtoc.1649. Rice plants release proton (H+) from root cells into rhizosphere area leading to the acidification of the rhizosphere and increased solubility of ferric iron complexes on the cell membrane, which is important for iron uptakes. Here, we present a detailed protocol to measure H+ flux in root hairs of transgenic rice seedlings and transgenic rice protoplasts by the Non-invasive Micro-test Technique (NMT). The NMT system is based on a non-invasive microelectrode technology that is automatically controlled by a computer, to achieve a three-dimensional, real-time, dynamic characterization of the concentration, velocity, and direction of a variety of molecules or ions. Because there is no need to directly contact the measured cells that could cause cell damage, we are able to obtain accurate and real time information on ion concentration. This is the first protocol that describes the non-invasive micro measurement technique of both root hairs and protoplasts in rice. In NMT, voltage differences are measured at two excursion points that are manipulated using a computer. Voltage differences can be converted into H+ fluxes using the ASET 2.0 (The imFlux® software) and JCal v3.2.1 Software. Analysis of the H+ fluxes provides a simultaneous measure of the crossing of a localized region of the root surface in response to stress, which provides real-time in-situ detection of net ion transport across membranes. This method will promote use of NMT in plant biology. Fourteen-day-old transgenic rice (Oryza sativa L. ‘Japonica’) seedlings that were transformed with pCAMBIA1302-OsSEC24-GFP were germinated on MS medium under controlled conditions in a 16 h light/8 h dark cycle at 28 degrees centigrade (°C). Secretory 24 (OsSEC24) is a component of the coat protein II (OsCOPII) vesicles that are required for secretory protein sorting, including of plasma membrane (PM) ATPase 2 (OsPMA2). Further information regarding OsSec24 may be found in Li et al. (2015). Chloridize the silver for 20 sec with 100 mM KCl by using a silver chloride device, as shown in Figure 1. Figure 1. Schematic diagram of the silver chloride device. A silver is connected to the positive electrode of the battery and a platinum wire is connected to the negative electrode of the battery. Fill the holder and microelectrode with 0.5 cm H+ liquid ion exchanger (LIX) and 1-1.5 cm NaCl/K2HPO4 buffer. Place the holder and microelectrode under the microscope lens and fill the tip of the microelectrode with 15-25 μm H+ LIX, as shown below and in Figures 2 and 7. Figure 2. Schematic diagram of a position of the microelectrode and LIX holder. Microelectrode (right) and LIX holder (left) are in the same field of a microscope. The picture is from YoungerUSA (Xuyue, Beijing) NMT Service Center. Install the microelectrode into the Non-invasive Micro-test device and manually place the microelectrode in the ready position, as shown in Figure 3. Figure 3. Connection diagram of microelectrodes and Non-invasive Micro-test device. The prepared microelectrode is inserted into the device. The picture is from YoungerUSA (Xuyue, Beijing) NMT Service Center. Calibrate each ion-specific microelectrode against a set of known pH buffers before and after each experiment with the ASET 2.0 software to prevent electrode drift (Figure 4). Click the Technique button and ensure ISP/PVP is set at X-30 before calibration, thus, setting the dx at 30 µm. Click the Technique button and choose Calibration, and input 0.0001 in the space for solution 1 and 0.01 in solution 2. Place the reference electrode and microelectrode into the standard medium buffer and ensure that the whole tips of reference electrode and microelectrode are immersed in the standard medium buffer. Calibrate proton (H+) microelectrodes in calibration medium (pH 7.0 and pH 5.0) by clicking Solution 1 and Solution 2 button, respectively, following the same procedure and standards (Figure 7). Only use H+ electrodes with Nernst slope between 53 and 63 mV/decade for measurement. Data must be discarded if the calibration is incorrect. Figure 4. 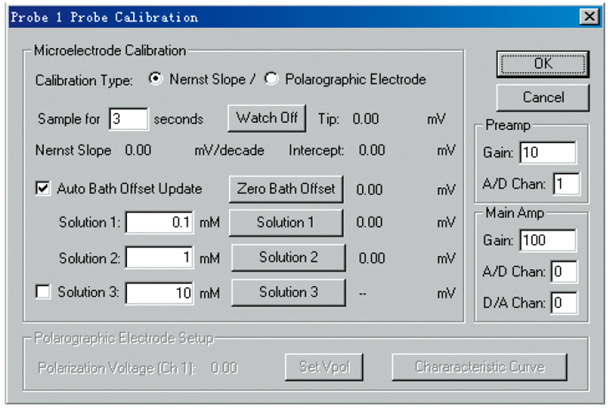 Interface of the electrode calibration in ASET 2.0 software. The picture is from YoungerUSA (Xuyue, Beijing) NMT Service Center. Wash and incubate transgenic rice roots in standard medium buffer for 5 min at room temperature. 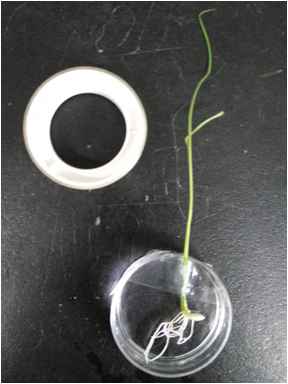 Place whole transgenic rice roots in the Petri dish with standard medium buffer using plastic strips (Figure 5). View root hairs and microelectrodes under high magnification (40x) with the Zeiss compound microscope by using the NIS-Elements AR software and position as shown in Figure 8C. Position microelectrodes close to the root hairs belonging to the mature region of the lateral roots, as shown in Figure 8C. Click the Mode button and choose Watch, then click the Record and Resume button to start computer measurement. Microvolt differences are measured at two excursion points at a frequency of 0.05 Hertz (Hz) manipulated with the help of NIS-Elements AR and ASET 2.0 software, as shown in Figure 6. The distance between the two excursion points (dx) is 30 micron (μm). Monitor kinetics of net H+ fluxes near each root hair for 15 min. Two roots per rice seedling and two root hairs per root were assayed. Figure 6. Interface of the watch mode in ASET 2.0 software. The picture is from Younger USA (Xuyue, Beijing) NMT Service Center. Microvolt differences are exported as raw data before conversion into net H+ fluxes by using JCal v3.2.1. Choose the H+ measured and the dr equal to the dx used, and input the slope and intercept measured during calibration. Finally, enter the data Origin(1) millivolts (mV) and AvgOrigin-X microvolts (µV) as measured by ASET 2.0 software(The imFlux® Software). H+ flux is then calculated directly by using the JCal v3.2.1 software. A positive number represents the outflow of H+ whereas a negative number represents the inflow of H+. The H+ flux assay of each group of transgenic rice root hairs consists of four independent replications (Figure 8). Figure 7. Schematic diagram of H+ flux detection. The microelectrode tip is filled with H+ LIX and NaCl/K2HPO4 buffer. The chloridized silver (Ag/AgCl) is immersed in the NaCl/K2HPO4 buffer. A voltage gradient (dV = V2 - V1) is measured by the electrometer between two positions over the travel range (dx). A concentration gradient (dc) is calculated using dV. D, H+ diffusion constant; J, net ion flux of H+. Figure 8. 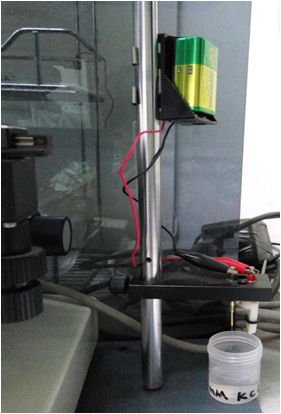 Measurement of H+ efflux in rice root hair by using NMT (Li et al., 2015). The results indicate the effects of OsSEC24 on H+ extrusion in transgenic rice roots under -Fe conditions. A. Kinetics of H+ flux in OsSEC24 transgenic (left) and wild type (WT) (right) rice root hair grown on -Fe or +Fe medium for two weeks. B. The mean rates of H+ flux in (A), using the mean value of four independent measurements (mean ± SE). Two roots in each plant and two root hairs in each root were assayed. **indicates P < 0.01 using Student’s t-test. (C) Measuring position using the H+-selective microelectrode during NMT. Incubate rice (Oryza sativa L. cv. Japonica) cells (in this case, courtesy of the Institute of Genetics and Development of the Chinese Academy of Sciences) suspended in NT medium at 28 °C at 150 revolutions per min (rpm) for 5 days under dark conditions. Perform protoplast isolation from rice suspension cells and transient expression similar to Li et al. (2015). Harvest rice suspension cells into a centrifuge tube and allow to stand for 15 min before discarding the NT medium. Incubate rice cells in the protoplasting enzyme solution for 1-2 h at 26 °C in an orbital shaker with gentle agitation at 50-75 rpm. Isolate protoplasts from the undigested material into a glass beaker with a cell strainer and centrifuge at 2,000 rpm for 15 min at 4 °C. Resuspend cells in 5 ml of washing buffer, followed by pelleting again by centrifugation for 15 min at 2,000 rpm at 4 °C. Resuspend in 0.3 ml of Mmg solution at room temperature before adding 0.03 ml of plasmids including pBIN20-OsPMA2-mcherry and pBI221-OsSEC24-GFP and 0.33 ml of PEG-calcium solution. Incubate protoplasts at room temperature for 15 min in the dark for transformation. Wash transgenic protoplasts with 0.3 ml of washing buffer and centrifuge for 15 min at 2,000 rpm at 26 °C before gentle resuspension in 1 ml incubation solution in a Petri dish and incubation at room temperature for 20-25 h.
Proton secretion is mediated from the cell to the environment by the plasma membrane (PM) and is typically conducted by H+-ATPases in plants. OsPMA2 is a rice PM-H+-ATPase and is sorted to the PM by vesicular trafficking. Further information concerning Ospma2 is available in Li et al. (2015). To prepare and calibrate the microelectrode, follow the instructions given in section A2a, above, altering step A2a-v such that ISP/PVP is set at X-10. Place transformed protoplasts in a Petri dish with standard medium buffer and incubate for 5 min at room temperature. View transformed protoplasts and microelectrodes under high magnification (40x) with the Zeiss compound microscope using the NIS-Elements AR software, positioned as shown in Figure 9C. Position microelectrodes close to three equally sized transformed protoplasts as shown in Figure 9C. Press the Mode button and choose Watch in ASET 2.0 software (The imFlux® Software). Press the Record and Resume button to start computer measurement. Microvolt differences are measured at two excursion points at a frequency of 0.05 Hz and manipulated with the aid of NIS-Elements AR and ASET 2.0 software (The imFlux® Software). The distance between the two excursion points (dx) is 10 μm. Monitor the kinetics of net H+ fluxes near each protoplast for 15 min. Export raw microvolt differences and convert to net H+ fluxes using JCal v3.2.1. Select the measured H+ and the dr equal to the dx used and enter the slope and intercept measured during calibration. Finally, paste the values for Origin(1) millivolts(mV) and AvgOrigin-X µV as measured by the ASET 2.0 software (The imFlux® Software). H+ flux is calculated directly by the JCal v3.2.1 software. A positive number represents H+ outflow whereas a negative number represents H+ inflow. The H+ flux assay of each type of transformed protoplast consists of three independent replications (Figure 3). Figure 9. Measurement of H+ efflux in transformed rice protoplasts using NMT (Li et al., 2015). The results indicate the effects of OsSEC24 on the transport of OsPMA2 in a rice protoplast. 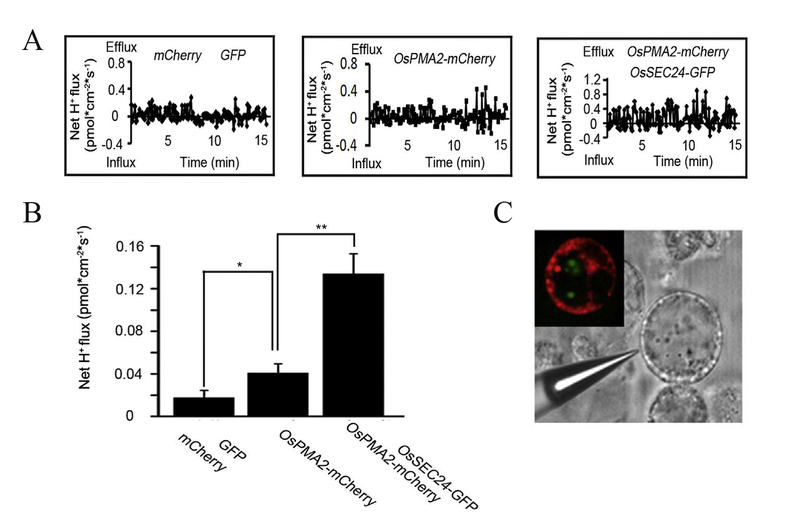 A. Kinetics of H+ flux in mCherry plus GFP double-transgenic rice protoplasts (empty vector on the left), OsPMA2-mCherry single-transgenic protoplasts (in the middle) and OsPMA2-mCherry plus OsSEC24-GFP double-transgenic protoplasts (on the right). The experiment was performed three times. B. The mean rates of H+ flux in A, using the mean value of three independent measurements (mean ± SE). *indicates P < 0.05 using Student’s t-test whereas **indicates P < 0.01 using Student’s t-test. C. Location of OsSEC24 (in vesicle, colored green) and PMA2 (in PM, colored red) in transformed rice protoplasts using confocal microscopy and measuring position using the H+-selective microelectrode of NMT. The protocol was adapted from our previously published paper Li et al. (2015). We wish to thank Younger USA (Xuyue, Beijing) NMT Service Center for technical support. This study was supported by the National Natural Science foundation of China (Grant Nos. 30770178 and 30971856), Beijing Municipal National Science Foundation Key Fund Projects (B) (Grant No. KZ200710028013), Beijing Municipal National Science Foundation (No. 5042004), and the Seventh Beijing Municipal Outstanding Teacher Award (2011). Li, S., Pan, X. X., Berry, J. O., Wang, Y., Naren, Ma, S., Tan, S., Xiao, W., Zhao, W. Z., Sheng, X. Y. and Yin, L. P. (2015). 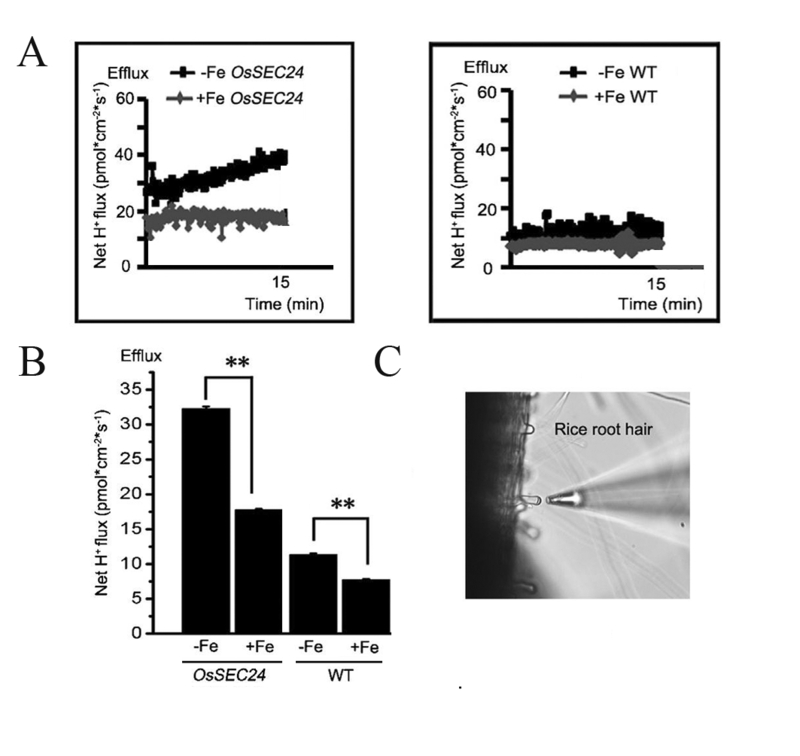 OsSEC24, a functional SEC24-like protein in rice, improves tolerance to iron deficiency and high pH by enhancing H+ secretion mediated by PM-H+-ATPase. Plant Sci 233: 61-71. Newman, I. A., Kochian, L. V., Grusak, M. A. and Lucas, W. J. (1987). Fluxes of H+ and K+ in corn roots : characterization and stoichiometries using ion-selective microelectrodes. Plant Physiol 84(4): 1177-1184. Sun, T., Li, P., Yin, L., Xu, Y. and Yu, S. (2007). Non-invasive scanning ion-selective electrode technique and its applications to the research of higher plants. Progress in Natural Science 17(6): 625-629. Tan, S., Han, R., Li, P., Yang, G., Li, S., Zhang, P., Wang, W. B., Zhao, W. Z. and Yin, L. P. (2015). Over-expression of the MxIRT1 gene increases iron and zinc content in rice seeds. Transgenic Res 24(1): 109-122. Xu. Y, Sun. T and Yin. L. P. (2006). Application of non-invasive microsensing system to simultaneously measure both H+ and O2 fluxes around the pollen tube. Journal of Integrative Plant Biology 48 (7): 1-5. Yang, G., Ma, F., Wang, Y., Feng, C. G., Li, P., Xu, Y., Zhao, W. Z. and Yin, L. P. (2010). Vesicle-related OsSEC27P enhances H+ secretion in the iron deficient transgenic tobacco root. Chinese Science Bulletin 55(13): 3298-3304. How to cite: Zhang, X., Zhang, X. and Yin, L. (2015). Measurement of H+ Flux in Rice by Non-invasive Micro-test Technology. Bio-protocol 5(23): e1649. DOI: 10.21769/BioProtoc.1649.